For the fifth year in a row, powerboat racing returns to the St. Johns River on Saturday, June 2. This year’s race is the third race of the Powerboat P1 SuperStock USA Series. The event runs from 10am until 3pm, and is free to the public. The best viewing for spectators will be from Memorial Park (1620 Riverside Ave). “Returning to Jacksonville for the 5th year in a row is a testament to a proven track record and delivering value in the form of an international television package in powerboat racing in over 100 countries. We enjoy and value our partnership with the City of Jacksonville”, said Powerboat P1 CEO Azam Rangoonwala. Joey Bergman, Business and Finance Manager with the City of Jacksonville’s Sports & Entertainment Office is very supportive of the race series returning to the area. 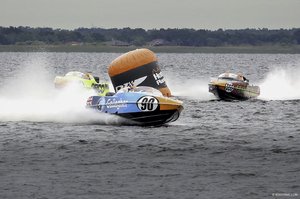 Bergman recently stated, “We are thrilled to welcome Powerboat P1 back to Jacksonville. The Grand Prix is a unique opportunity to activate our waterways and grow Jacksonville’s brand as a sporting and tourism destination to an international audience”. Eight SuperStock race teams, which are 28’ one-design open canopy boats averaging speeds of 70 mph, will be competing for the checkered flag. The battle of the SuperStock series continues this weekend in Jacksonville! The local team favorite continues to be Visit Jacksonville, Driven by George Ivey joined by Navigator Bryan Lynch. The Visit Jacksonville race team is a family team with all members originally from the area. “We are very excited about the 2018 season. The boats are all being re-rigged with new hulls, which should add a whole new element of competition being a little lighter, a bit faster, and handling a little different. It should make things very interesting and very exciting for spectators. Our Visit Jacksonville team is excited about making our mark this season and hopefully ending up at the top of the podium”, indicated Visit Jacksonville Driver George Ivey. The P1 SuperStock race season kicked off April 20-22 in Miami, FL and wraps up on July 1 in Sarasota, Florida. HotelPlanner.com is the official hotel booking partner for Powerboat P1. Suncoast Charities for Children is the official charity partner for Powerboat P1. The Jacksonville race will be aired post-event on Fox Sports Florida in July. For more information about this upcoming event visit p1superstock.com.